Long before I left home in June to visit Alaska this summer I knew that the birds I most wanted to see there were puffins. This was the main reason why I traveled way out into the Bering Sea to the Pribilof Islands where they nest. I had seen many photographs of puffins and couldn’t believe that any birds could be that cute. I just had to see and photograph them for myself. Actually, even before going to the Pribilofs, I got glimpses of puffins when I took cruises through Kenai Fjords National Park and Kachemak Bay two or three weeks earlier. But all the puffins I saw there were sitting on the ocean at a distance. Puffins belong to the alcidae, or auk, family of seabirds. While we call three species puffins, we know now that four of them exist. Three of them live in the North Pacific Ocean, while the East has only Atlantic puffins in the North Atlantic Ocean. Here in the West we have tufted puffins and horned puffins — and rhinoceros auklets, which don’t look at all like puffins, but anatomically still are puffins. I saw them in Kenai Fjords. 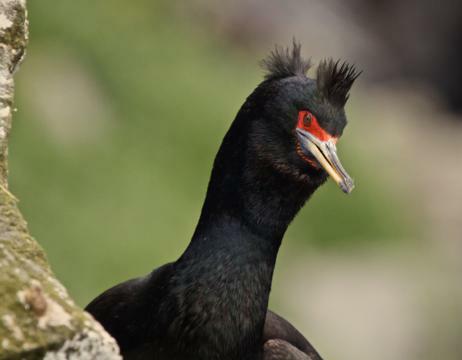 If rhinoceros auklets look strange, horned puffins don’t even look real. Auks are birds in the alcid family. They range in size from the 3 ounce least auklet to the 2.2 pound thick-billed murre. While they are good swimmers and divers, when they walk on land they look clumsy. Auks look somewhat like penguins with their black-and-white coloration, their upright posture, and some of their habits. Auks fill a similar ecological niche in the northern hemisphere as penguins do in the southern hemisphere. But auks (except for the extinct great auk) can fly. Auks and penguins are examples of convergent evolution. Auks live on the open seas of the cool subarctic ocean. They only go ashore for breeding, and the Pribilof Islands are one of the best places to find them. While I went to Saint Paul Island, the largest of the Pribilofs, primarily to see its fabulous puffins and other alcids, I saw many other beautiful birds there too. Among them were several that came packaged in various shades of red that particularly excite me. One of these is a member of the widespread family of cormorants. We have so many double-crested cormorants in Colorado that those cormorants don’t excite me any more. But the red-faced cormorants I saw in Alaska do. This species is both exceptionally colorful and has a very limited range. The red-faced cormorant lives only on the cold seas of the southern Alaska coast. Gray-crowned rosy finches live on open ground at the top of mountains from Alaska to California and on the Aleutian and Pribilof Islands. But “due to its remote and rocky alpine habitat,” Wikipedia says, “it is rarely seen.” I had the good fortune to see this one. The Pribilof Islands have the largest gathering of marine mammals in the world. In addition to seeing thousands of northern fur seals I also saw some Stellar sea lions and sea otters, but failed to see any walruses. By contrast, land mammals are much less common. And only small numbers of three species of land mammals are native to the Pribilofs. Only two of these, the arctic fox and the shrew, live on Saint Paul Island. The other one, the lemming, lives only on Saint George Island, where I only landed at the airport. While I saw arctic foxes several times, I didn’t see any shrews. One of my guides, Doug Gochfeld, found one when he turned a rock over, but the shrew scampered away before I could get there. The scarcity of land mammals on these isolated islands doesn’t surprise me. What does surprise me is that some of their ancestors must have made a long, perilous journey over hundreds of miles of drift ice to get there. 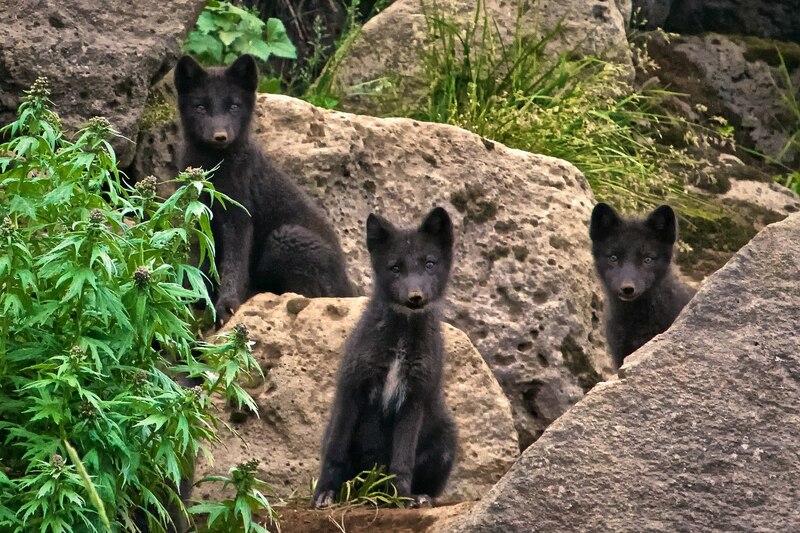 The progenitors of the arctic foxes native to the Pribilofs must have arrived thousands of years ago because they are generally darker than those found elsewhere, which are dark gray to bluish brown in the summer and white or creamy white in winter. Not until my last full day there did I get close enough to arctic foxes for good photographs. And these were a whole family. 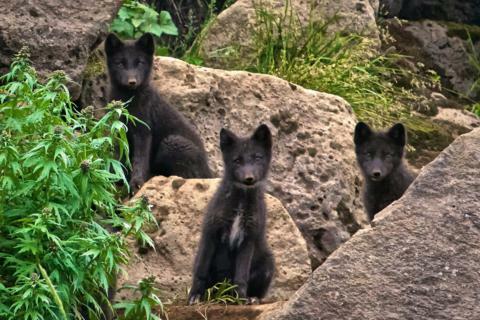 Even better, the family included several quite cute pups. During one of the five days I explored the Pribilof Islands, one of my St. Paul Tours guides, Doug Gochfeld, took me to Southwest Point on Saint Paul Island. There we spent several happy hours watching and photographing the thousands of alcids on the cliff ledges just below us. 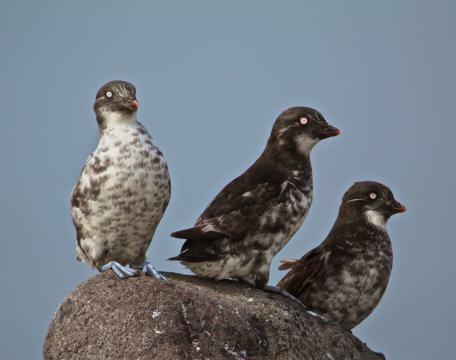 Alcids are a family of birds that includes the auks, murres, and puffins. 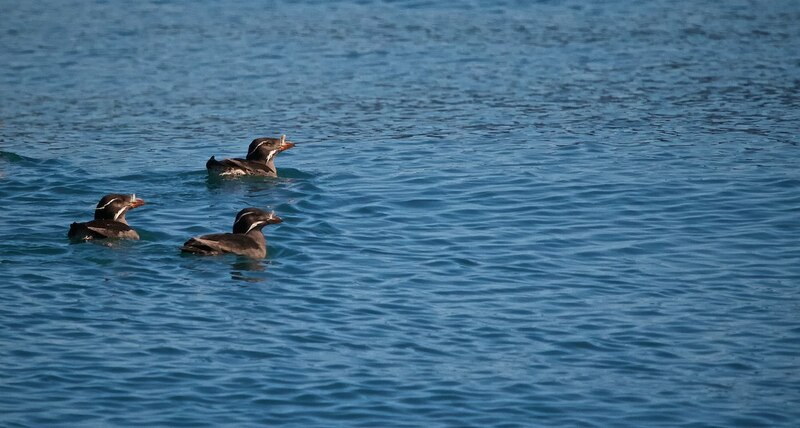 They are pelagic birds, those that live on the open ocean and rarely venture onto land except to breed. My main reason for traveling to the Pribilofs was to see these strange birds. Doug drove us to the point in one of the few vehicles on the island. Not many vehicles get there because freight charges are so high, about $10,000 each, and because the island has no automotive repair facilities. As a result, the vehicles that make it to the island are in poor repair. We rode in a reasonably new Toyota SUV, but a passenger-side door was held on with rope because an earlier traveler failed to hold it when he opened it in the wind. Once we reached the end of the road, we walked along the cliff edge. Very carefully. Not only did we prefer to avoid stepping into the ocean but we also wanted to avoid stepping into a hole that we couldn’t see through the tundra that we walked across. There is no trail, but I only stepped into one hole, which fortunately was only four feet deep. On the way back to the SUV from birding at Southwest Point we paused to study the tundra. The Pribilofs are volcanic and therefore rocky, but except on the beaches, almost everywhere the aspect is of lush, green, coastal tundra. Only seven trees grow on the island, and none are taller than three and one-half feet. 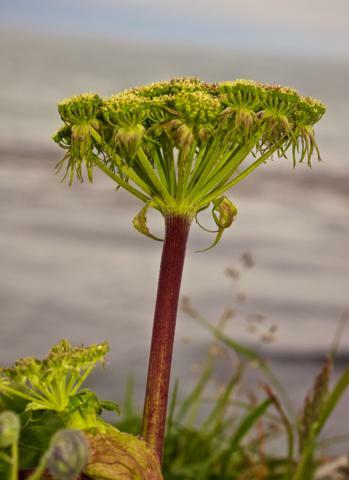 My guide, Doug, introduced me to one of the edible plants that grow almost everywhere on the island. Wild celery looks and tastes very much like the tame stuff that I sometimes add to my salads, except this wild variety is somewhat sharper tasting. The Pribilof Islands in the Bering Sea were everything they promised to be: cold, wet, windy, and usually foggy or overcast. They also have 450,000 northern fur seals and uncounted millions of birds. When my friend Marveen and I planned this trip to Alaska, she suggested that I visit the Pribilofs. While she had never been there herself, she was familiar with them from her wide reading. After I did some research, I signed up for a five-day tour that St. Paul Island Tours, a subsidiary of Tanadgusix, the Aleut Alaska Native village corporation that owns more than 95 percent of Saint Paul Island and all or part of its fish processing industry, hotel, cable television, and tourism businesses. But when Marven and I discussed my planned tour of the Pribilofs while I was staying in her home, we both had considerable regrets. She was concerned that her recommendation might be a bad one. I was specifically worried about the bad weather I was sure I would experience and thought that I had already had such a magnificant trip to Alaska that visiting the Pribilofs could be a letdown. We needn’t have worried. The Pribilofs were a highlight of my nine-week visit to Alaska. These islands are famous among birders and naturalists, although few other people have ever heard of them. They are one of the three most isolated places I have ever visited. The coast of Siberia is 500 miles west, but the only way I could get there was an 800-mile flight from Anchorage. Formerly called the Northern Fur Seal Islands, these isolated islands are the breeding grounds of the fur seals, which in the late 18th century fur traders knew had to be somewhere in the ever foggy Bering Sea. After years of searching, a Russian fur trader named Gavriil Pribylov in 1786 and 1787 discovered the breeding colonies on these previously uninhabited islands. Then, a few Russians and a few hundred Aleut slaves from the Aleutian Islands to the south proceeded to kill as many of the fur seals as they could. When we bought Alaska from Russia in 1867, we especially wanted the big money from the slaughter of the fur seals, which we intensified, so much so that by 1911, when the United States, Russia, Japan, and Canada signed the North Pacific Fur Seal Convention, the fur seals had come close to extinction. The Aleuts were slaves, first of the Russians and then of the Americans. I don’t use the term “slaves” loosely. The Aleuts were truly the “slaves of the harvest” as Barbara Boyle Torrey’s sad but excellent book of that title so fully documents. I bought and read this book on the recommendation of Jason Bourdukofsky, the president of Tanadgusix Corporation, who I got to know. Like most of 700 people who live on the islands today, he has an obviously Russian surname. 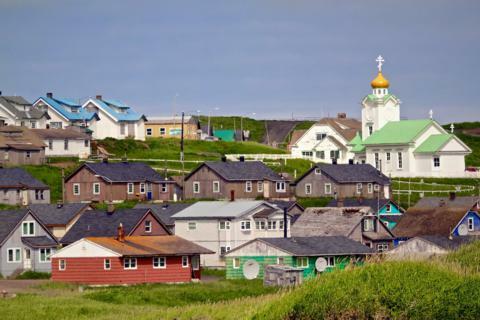 In fact, almost all of the natives of the island are also members of the Russian Orthodox Church. Russian influence lives on here, partly I would guess because until recently we didn’t treat them any better than the earlier Russian colonists. Jason told me that he was a baby when the U.S. government evacuated all of the Aleuts from the Pribilofs and the Aleutian Islands in 1942, giving them just a few minutes to pack one bag for what turned out to be a multiyear exodus from their homes. We all know that at the same time our government did the same thing to people of Japanese ancestry, but I didn’t know that we did that to this American Indian tribe. Jason told me that half of his people died in the internment camp at Funter Bay, including his grandfather. Jason also told me that he is one of just six native speakers of the Aleut language who remain alive. He is is also the president of the school board, which at his urging now requires some Aleut language and cultural instruction. The city of Saint Paul on Saint Paul Island has the largest Aleut community on Earth. Out of a total population of 532 people, 457 of them are Alaska Natives. About 100 more people, almost all Aleuts, live on the other inhabited Pribilof Island, Saint George. The northern fur seals are the biggest of the 11 species of seals in the world. The males can weigh up to 650 pounds and are four to six times larger than females, which is probably the greatest size difference of any mammal. Enjoying nine weeks of an Alaskan summer without seeing the state’s coastal brown bears would have been unthinkable. I wanted to get up close to them and yet not too personal. I succeeded with the great help of Alaska Bear Adventures and their pilot-tour guide, Derick Broderman. Only in Alaska can we expect to see bears with no bars or cars between us and them. This is as wild an experience as we can get, and my tour was a wonderful as they come. I saw more than a dozen coastal brown bears, and some of them came quite close. These are the same species as the grizzly bears that live in inland Alaska. But coastal brown bears are bigger than grizzlies because they have a richer diet, especially salmon. The most reliable places to find coastal brown bears are two of Alaska’s national parks, Katmai and Lake Clark. Both are across Cook Inlet from the Kenai Peninsula, where I stayed for five of my nine weeks in Alaska. Unlike the even larger Kodiak brown bear subspecies, we haven’t hunted them in Lake Clark and Katmai National Parks, which are the only places where we can with reasonable safety get out in the open with them. But bears have been scarce in Katmai recently. Alaska Bear Adventures flies to either of these parks depending on where more bears are hanging out. So we went to Lake Clark National Park. No roads penetrate this wilderness, which people can reach only by plane or boat. I had never been to there before, so this trip boosted my total to 40 of our 58 national parks. On my fifth trip to Homer I got there in a six-seater Cessna 206. I had the co-pilot’s seat, which gave me greater visibility and got this shot as we came in for a landing on the beach at Chinitna Bay of the Cook Inlet where Hook Creek and West Glacier Creek enter the bay. Not since I traveled to Somalia in November 1963 have I had the experience of landing and taking off from a beach. In neither case was I concerned, but both times we had to fly through clouds so thick that visibility was zero, which did concern me. While we were flying blind in Somalia, here in Alaska we were in radio contact with all the other planes in the area. But I didn’t know that until afterwards. Kachemak Bay is a 40 mile long arm of Alaska’s Cook Inlet on the southwest side of the Kenai Peninsula. My fourth trip to Homer took me there for a three-hour birding cruise with Bay Excursions Water Taxi and Tours. This is in fact just a local naturalist, Karl Stolfzus, his cell phone, and his boat. But Karl was a great guide. When I left Wayne and Marveen’s home, the weather was sunny in line with the prediction for the day’s forecast. But soon after I set forth, clouds rolled in and totally obscured the sky. More than once I considered opting out of the tour, for which I hadn’t paid in advance, but when I took another look at the weather forecasts, no day in the immediate future promised to be any sunnier. So I proceeded. Glad that I did. While the dim light made me boost the ISO to 3200 for almost all of my photos, my software removed the noise. Karl’s boat was docked at Homer’s small boat harbor along with hundreds of other vessels, mostly fishing boats. Long known as the “halibut fishing capital of the world,” Homer is home to many fisherfolk. With Karl steering and spotting, I went out into the bay with two couples, all dedicated birders. 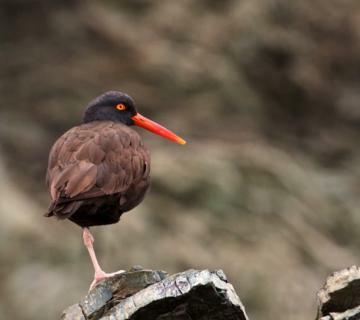 We saw a huge number and variety of birds and sea mammals, but the bird that I most wanted to see was a black oystercatcher, which I had never seen before. 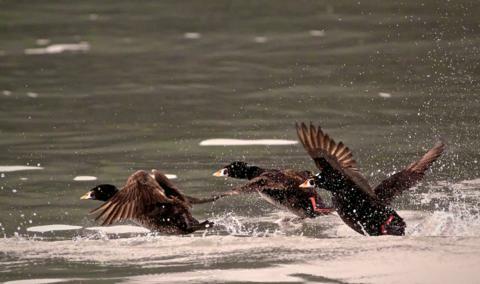 ​I had seen surf scoters before. But I had never captured them in flight, and now I know why we call them surf scoters. When I stayed with my friends Marveen and Wayne at their home in Nikiski, Alaska, I often made the 95 mile drive to Homer at the southernmost point on the Kenai Peninsula that you can reach by road. I went there five times. My first trip to Homer took me to the Alaska Islands and Ocean Visitor Center. Taking a short walk from the visitor center down the Beluga Slough Trail to Bishop’s Beach was a memorable experience. 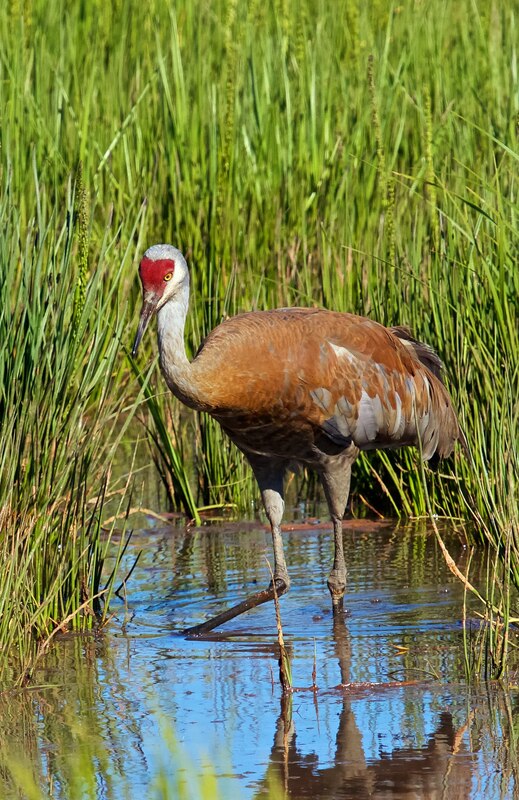 The sky was clear, the weather was warm, a slight breeze was blowing, and the marsh was shimmering in the sun as I talked with a couple from DC as we stood and watched a pair of greater sandhill cranes who had painted themselves with the orange mud. I told the tourists that after we get home they needed to remember this magical moment in our lives. Of course, I was really telling that to myself. At the visitor center itself I lucked out by meeting and becoming friends with two volunteers, Sue and her husband John. I happened to get to the center just before she was scheduled to lead a free birding tour of Homer that offered a great introduction to the area. Later, they invited me to a private tour. John drove us out East End Road up the bay where, at some place that I couldn’t begin to pinpoint, we got out and walked an animal track through really boggy ground to a lake. What a beautiful setting! By that I mean the total absence of any sign of human destruction of the land. We saw a pacific loon and a pair of trumpeter swans and three duck chicks (without their parents) on the lake. On the way back Sue and I lagged behind to photograph some beautiful Alaska flowers, including a Star Gentian that she subsequently identified for me. 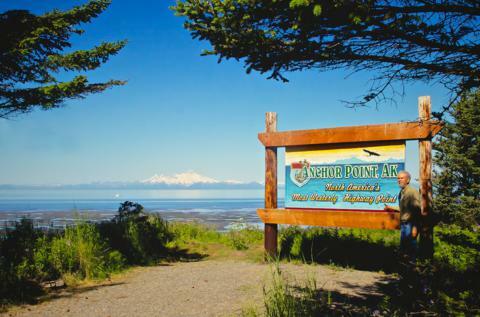 Anchor Point is just a stop along the way for people who drive to Homer at the end of Alaska’s Kenai Peninsula, if that. But I found some good reasons to go there several times. And this isn’t the only great place to stop en route to Homer. 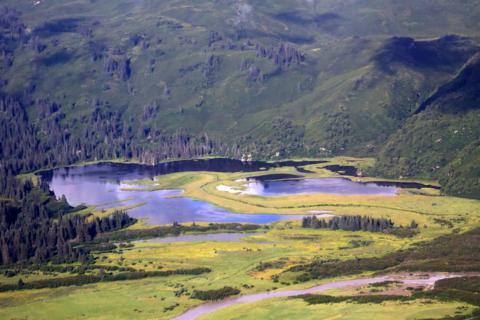 Founded by Russian colonists in 1847, the town of Ninilchik, which is 58 miles from where my friends live in Nikiski and 24 miles before coming to Anchor Point, is also worth a visit for a taste of the Russian cultural heritage of Alaska. Some people in Ninilchik still speak the local dialect of Russian and worship in the local Russian Orthodox church, which their ancestors built 112 years ago. Across Cook Inlet from the church is the 10,000 foot volcano of Mount Iliamna. 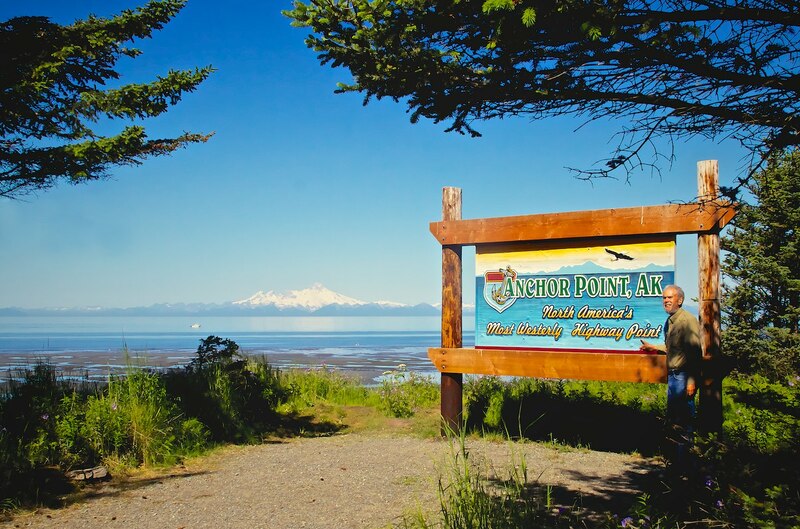 The first time I went to Anchor Point was because I wanted to be at the westernmost point in the North American highway system.